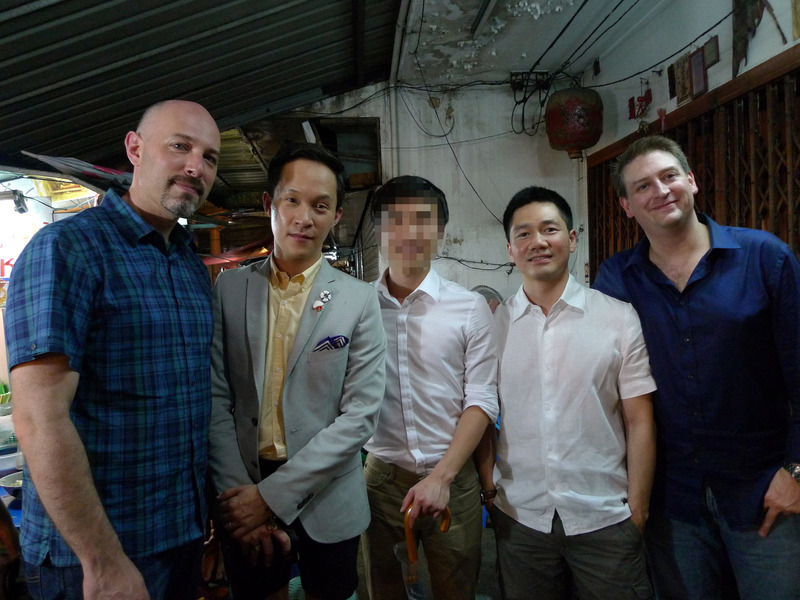 While it wasn’t an official Xanga meetup, I managed to meet a trio of Xangans here in Bangkok over the last week, none of whom I’ve ever met in person. A week ago Friday, both Rudy (@rudyhou) and Andrew (@stepaside_loser) were in town from Indonesia and Australia, respectively. It was a coincidence that both were here at the same time and presented a nice opportunity for us to gather for dinner at Soulfood Mahanakorn followed by some dessert at a street vendor nearby. From left: Me, Tawn, Andrew (who requested that his identity be obscured), Rudy, and Rudy’s friend Sam. Sam isn’t a Xangan but is still a nice fellow! Very nice meeting everyone. 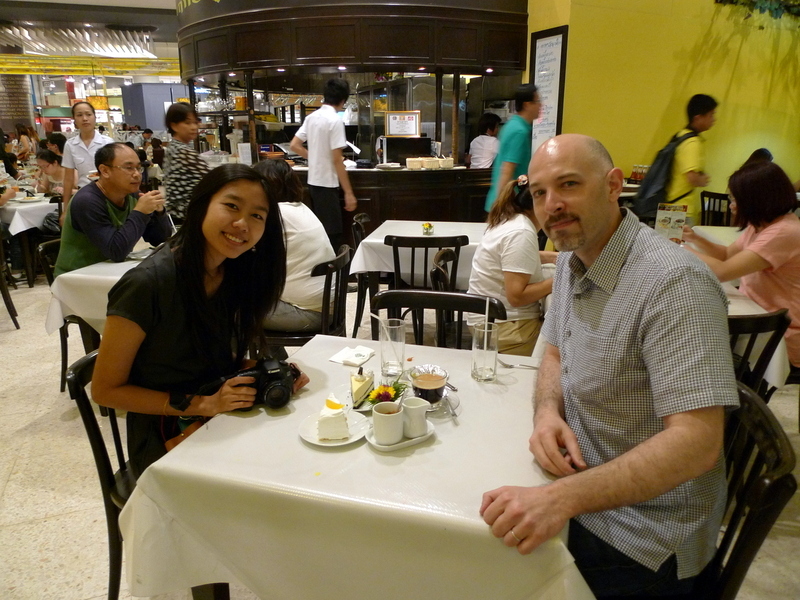 Now, another Xangan whom I knew lived in Bangkok but had managed to forget is Marlar (@I_love_Burma). We had been in touch several months ago and it wasn’t until another Xangan, who is coming to visit her in a few weeks, messaged me to see if I’d be in town, that I remember that Marlar actually still lives here! I invited her to the impromptu meet up two Fridays ago but she couldn’t make it, so we instead met for lunch yesterday. See? It really is a small Xangan world! Now, I’ll be seeing Rudy again, along with three or four (or more) other Xangans in Hong Kong on December 28-29. If you will be in that neck of the woods, let me know and you’re welcome to join the meet-up. This entry was posted in Uncategorized and tagged IloveBurma, Meetup, rudyhou, stepasideloser, Xangans by christao408. Bookmark the permalink. Sounds like a reunion going on!! I feel it great to be able to meet other Xangians in person. Enjoy! Great photo of the group and pretty young lady. Nice. Rudy is always traveling and cool to know that the HK meet-up plan is already set. Oh those anonymous bloggers. I can never figure out what they look like! I will have to run this picture through my de-pixelator software. Good meet up with fine people. Xanga is richer in having such people here. I am sure they were thrilled to meet the celebrity of Bangkok xanga bureau too! Oh the anticipation of the meet up haha. It was cool and unique that I knew a part of who you guys were before even meeting you guys in person. Here’s to many more. @ElusiveWords – Muahaha. It was great meeting you, Chris! Looking forward to many more. Hehe :D@Roadlesstaken: Do that!! I’d loveeeee to meet you. @I_love_Burma – nope. I’ve never posted a picture of myself. You haven’t missed anything – hahaha. Xanga meets are always fun… Was Sam giving the photographer the finger or was that just an accident? How wonderful and love seeing the photos. Wow, andrew went to visit!What did you take him to? @Wangium – Just dinner. Despite my multiple offers, he and the friend with whom he was traveling (who we did not get to meet) arranged their own sightseeing. @christao408 – I’m not sure about HK yet but BKK seems like a go next year. you know, chris. i was hoping that you would post about our meet-up so i won’t have to. but now i’m thinking that maybe i should, which means i would have to borrow your pic of us. @oxyGENE_08 – i’d second that. never been to the philippines before. @murisopsis – you know, i just realized that. hahaha… good catch.